The magnetic field strength of the FONAR UPRIGHT® Multi-Position™ MRI is 0.6 Tesla. At 0.6 Tesla, it is categorized as a “Mid-Field” MRI. Most “Open” MRIs (all of them recumbent-only scanners) operate at 0.3 Tesla. Many equate magnetic field strength to image quality – the higher the field, the better the image. All other things being equal, that is a fair statement. In fact, however, all other things are not equal, meaning that in comparing one MRI to another, field strength is only half of the story. The magnetic configuration of the UPRIGHT® MRI is dramatically different from all other MRIs, both High-Field MRIs and so-called “Open” MRIs. As a result, the UPRIGHT® MRI is able to use both solenoid and planar RF receiver coils. No other MRI can do this. 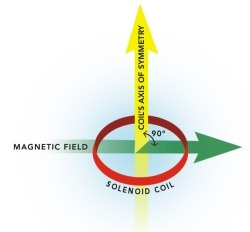 The RF receiver coil achieves maximum sensitivity when its axis of symmetry (yellow arrow) is perpendicular (90 ) to the direction of the magnetic field (green arrows). The UPRIGHT® MRI has a unique magnet design, which allows it to employ this principle in two ways. 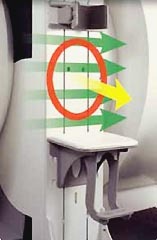 The patient is positioned between two vertical poles so that the magnetic field transverses the body in the left-right direction (green arrows) This unique design allows both flat planar and solenoid (“wrap- around”) coils to be used separately or in combination (in quadrature). 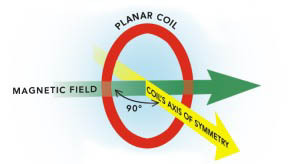 The red circle represents a flat planar coil. A flat planar coil is used for a lumbar spine scan. A solenoid (“wrap-around”) coil is used for a cervical spine scan.